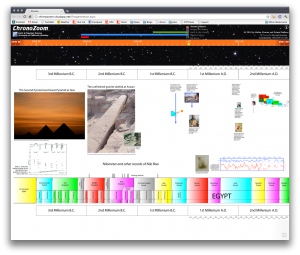 Surveying all of cosmic history using ChronoZoom: you can't even see human history up there in the upper right corner. Historians aren’t always the best at crossing the hall to the sociologists across the way, let alone the astronomers, physicians, or geologists across campus. Scientists who study the Big Bang, however, are engaged in history – just a (very) different kind. Similarly, those who study the very long-term geographical forces that have shaped Earth, those who study evolutionary processes across flora and fauna, even those who study broader, galactic or universal phenomena, are often seen as very distinct from historians. Big History, a new and emerging field, seeks to bridge these very real but also occasionally artificial disciplinary boundaries. It can be hard, however, to really establish how we can go forward and what a Big History approach might look like in real, deliverable terms (Bill Gates and David Christian have a great project also looking at how to teach these concepts to classrooms). Look no further: ChronoZoom, from the University of California-Berkeley’s Department of Earth and Planetary Science, has a working model that gives us a sense of what this might look like. What is ChronoZoom? Just as historians cannot reasonably access millions of books without heavy computational aids, humans have difficulty even conceiving of the scope of ‘big’ human history that covers billions of years. ChronoZoom, “a tool to aid the comprehension of time relationships between events, trends, and themes,” aids in this. The most developed big history project yet in existence, ChronoZoom ties together extant online resources (scholarly articles, photographs, audio-visual media, etc.) by placing them along a constant timeline, stretching along a 13.7 billion year continuum from the Big Bang until the present day. While this would be initially overwhelming, its use of Microsoft’s Seadragon Deep Zoom technology – a smooth means of transitioning around an extremely large and high-resolution file without overwhelming the computer (similar to how one navigates Google Maps) – will allow a user to swap between an overview of natural history, a snapshot of human history, to a more focused overview of major events in the 19th century. 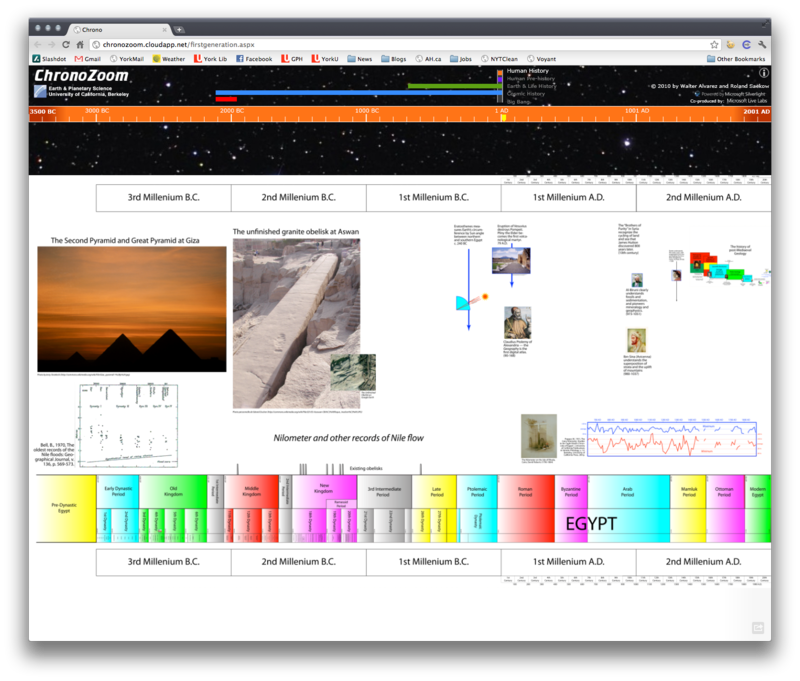 Historians use time as a primary frame of analysis, and ChronoZoom represents the first major search engine project to recognize it as a constant base. Imagine using this in a classroom, to give students a sense of how long ago events truly were. Or, just sitting at home, using it almost as a “total perspective vertex” as Douglas Adams humorously foresaw in his Hitchhiker’s Guide to the Galaxy. 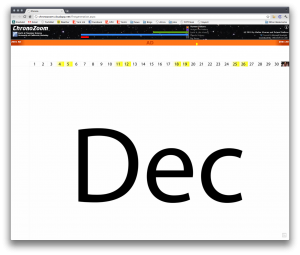 ChronoZoom isn’t fully fleshed out yet, but a very good working demo let’s us see some of the potential. Please fire it up yourself here (you’ll need to download Microsoft Silverlight for it to fully work). At first, it looks like a static poster (pictured above): sophisticated, to be sure, but nothing too exceptional. In the lower left hand of the poster we have the Big Bang, and, in the upper right, we have human history. However, you can’t see any human history at this point – it’s too small. But if you click on the ‘human history’ bar at the top, we begin to rapidly and fluidly zoom into the upper right hand of the corner. Cosmic history recedes into the foreground, Earth & Life history as well, pre-history appears and disappears.. and then we see human history. This process really needs to be played out for yourself: watching billions of years fly by, receding, our ‘human history’ a mere dot in this billions of years. 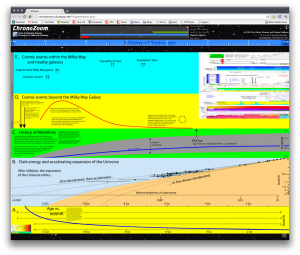 December 2000: on the very same chart that contained all of Cosmic History! And from here, we can zoom in even more: to the 2nd Millenium A.D. for example, to the 20th Century alone, to its 10th Decade, to the year 2000, until finally, in the very upper-right corner of the map, we see New Year’s Eve of the year 2000 (and the beginning of our 3rd Millenium). This is a fantastic way to describe, deliver, and allow people to dynamically manipulate an otherwise inconceivable amount of historical information covering an absurd amount of time. It seems weird to be describing, in text, such a dynamic website. What are you waiting for? Get out there and check it out! What do you think about it? I’d love to hear in the comments below. If Big History fascinates you, please watch this TED video by David Christian on Big History. I guarantee you’ll find it entertaining and provocative.